V - Suitable for Vegetarians • Delicious, refreshing fizzy drink in a traditional glass bottle • Sealed with a glass marble that falls into the neck when open... Peel the wraper off of the cap. There's a little green thing sitting on top. Take it off the top of the bottle and you can see the marble sitting inside. 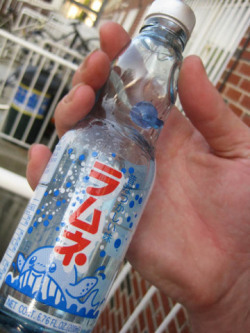 Ramune bottles are made of glass. The neck and top of the bottle is very unique looking. The interesting part of a Ramune bottle is that inside of the bottle is a marble that seals the opening of the bottle. 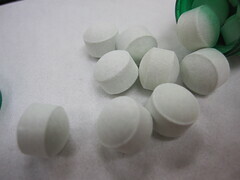 To drink Ramune, you’ll have to push the marble back and let the liquid flow through the sides. Rather than a plastic twist cap or typical beer bottle cap, Ramune uses a Codd-neck bottle, where a marble is used to close the opening. There are two ways to open a bottle of Ramune. The first is to follow the directions on the bottle – remove the cap, separate the small plunger, and press the plunger into the marble until it pops in.